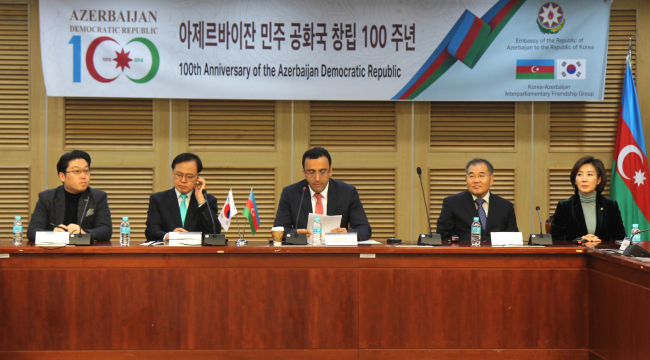 Marking the centenary of the Azerbaijan Democratic Republic, the Azerbaijani Embassy in Seoul organized a conference and photo exhibition Nov. 19 at the National Assembly in cooperation with the Korea-Azerbaijan Interparliamentary Friendship Group. “Azerbaijan Democratic Republic -- the first parliamentary democracy with a republican form of governance in the Muslim world -- was also the first model of a democratic secular state all over the East, including the Turko-Muslim world,” said the country’s Ambassador to Korea Ramzi Teymurov in a speech. The Azerbaijan Democratic Republic combined European democratic values and the East’s cultural heritage, the envoy said, adding that suffrage was granted to all its citizens across ethnic and religious affiliations. Its women became the first in the Islamic world to gain suffrage, ahead even of women in some Western countries. Despite its short existence from 1918-20, the nation implemented political and economic reforms and established democratic institutions, a national currency, anthem and flag, banks, army and other state apparatuses. It was also internationally recognized as an independent and sovereign state, with the Paris Peace Conference and the Treaty of Versailles on Jan. 11, 1920, stamping de facto recognition of its independence. The conference at the National Assembly gathered prominent politicians, including Rep. Lee Myong-su, chairman of the Korea-Azerbaijan Parliamentary Friendship Group, and Rep. Na Kyung-won, as well as journalists, professors, students and representatives of foreign diplomatic missions. It featured the documentary film “Lifelong Mission” -- a story of the Azerbaijani delegation to the Paris Peace Conference in January 1919 -- produced by the Baku Media Center. Participants walked down the National Assembly building’s main corridor to reflect on photos of modern Azerbaijan. Turning to post-Soviet Azerbaijan, the ambassador said Baku faced economic and political crises, a civil war and occupation of its territory by neighboring Armenia during the early years of independence. “An undeclared war against Azerbaijan by Armenia resulted in 20 percent of our territory being occupied,” he said, referring to the Nagorno-Kharabak region and surrounding areas, which have produced large numbers of refugees and internally displaced persons.